When you travel a lot, the hotels all begin to seem the same. But every once in a while you stay in a hotel that's so beautiful, so memorable that you can't stop thinking about it for months to come. That's how I felt after my stay at Hotel Emma in San Antonio. Every detail was attended to, the decor was stunning, the beds were a dream, and I felt like royalty throughout my entire stay. 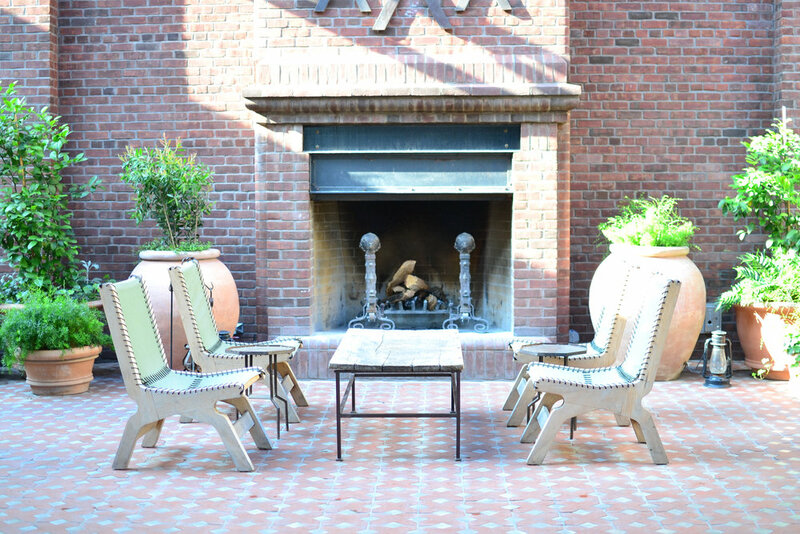 I had the distinct pleasure of staying at Hotel Emma as part of a press trip with Chevy. We landed in Austin and used our Chevy Equinox to road trip through Fredericksburg, then ended up in San Antonio for the weekend. After a few hours on a plane, then a few more hours in a car, we were exhausted and ready to relax. From the moment we pulled up to Hotel Emma and the valets took our car, we knew we were in for a treat. My first thought when I stepped foot through those beautiful black doors at the entrance of the Emma was "I'm going to get so many amazing Instagram photos here!" But seriously. Every detail, every inch of this magnificent hotel is on point, and their goal is to make you feel like you're staying at a cultured, interesting friend's house. I have to say - they nailed it! There are multiple spots throughout the lobby to lounge, read a book, share a drink with a friend, or just soak in your surroundings. I think I would have been happy staying at our hotel the entire time we were in San Antonio. The rooms were comfortable and aesthetically pleasing. I especially loved the style of the throw pillows on the bed and couch and took a mental note to find similar ones (TJ Maxx??) once I returned home. It feels kind of strange to say, but even the bathroom was beautiful! The brass accents against the blue and white tile were the perfect touch. After taking your sweet time getting ready with the Malin + Goetz toiletries the Emma offers, slip into a lightweight seersucker guayabera robe while you put the finishing touches on your hair and makeup. There was plenty of room on the comfy couch to get some work done, which was especially important for me, as I was on a press trip! I wanted to get photos uploaded so I could post them in real time and take notes on every fabulous detail I was experiencing. Oh! I almost forgot the most IMPORTANT perk of staying in a Hotel Emma guestroom - the complimentary La Babia Margarita upon check-in. It's nothing fancy - just tequila, lime, and Cointreau, but those margaritas were the perfect pick-me-up after a long day of travel. In addition, each afternoon included turn-down service in the form of French macarons from Bakery Lorraine and chilled water. I seriously did not want to leave. If you're visiting San Antonio when the weather is hot, you'll definitely want to make use of the rooftop pool. Not only can you sip a freshly-made cocktail from the resident bartender, but you can do it while enjoying the view of the Riverwalk and San Antonio skyline. If you head downstairs, there are a few dining options within The Emma. We loved The Larder, a coffee shop which also carries groceries and a few prepared food items. It's located back in the old fermenting cellars, and I got the most delicious latte to start my day there. We actually spent quite a bit of time just wandering the hotel property. Just outside the main entrance are the most gorgeous sitting areas. I was especially fond of this little spot below with an outdoor fireplace and rustic table. What better spot to enjoy a margarita before heading out to the Riverwalk for the night? Hotel Emma is located in the Pearl District of San Antonio which is one of my new favorite places on earth. 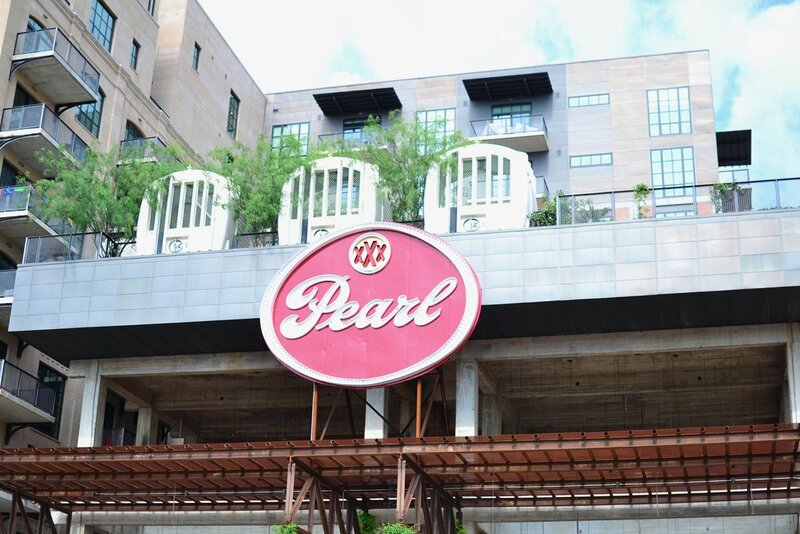 Yes, San Antonio is known for the vibrant Riverwalk and downtown areas, and of course the Alamo, but I think the Pearl District doesn't get nearly enough buzz. We meandered off the hotel grounds at all times of day and even at night feeling completely safe. Everything was so well-kept, neat, and clean. The locals seemed to be enjoying their community, and every business seemed thoughtful and unique. We dined at Down on Grayson our first night there. We were exhausted from our travels and didn't think we were quite up for a trek down the Riverwalk. Down on Grayson was the perfect spot to grab a hearty meal. They serve American cuisine and have a casual and contemporary atmosphere. If there happens to be a wait, you can sip a cocktail on the sprawling patio. Be sure to check out the weekend market with fresh produce, prepared food, and crafts. It takes place right in front of the old brewery. We grabbed lattes at Local Coffee before we perused the market, and we definitely made sure to try some freshly made beignets. Hotel Emma is a luxurious boutique hotel, and rooms go for around $315/night depending on when you book. As I stated above, my stay was covered as part of a press trip I was on. However, I loved every second of my stay. I honestly have never felt so pampered in my life. I would probably not pay that much to stay there if my children were with me. I don't know that I would be fully able to relax and enjoy the amenities while worrying about whether the kids were too loud or getting into something they weren't supposed to. I would, however, splurge on a trip with just my husband, or a getaway with girlfriends. It would be well worth it, in my opinion. For more information on Hotel Emma, head to their website. Get More Family Travel Tips! If you’re a mom who loves to explore, subscribe to our newsletter and get a free road trip scavenger hunt!